Toothbrushing in the morning – When? You are here: Home / Dental Tips / Toothbrushing in the morning – When? This is one of the basic and most controversial topic among people, among dentists and among those who study dentistry. When do people brush their teeth in the morning? Before or after breakfast? I always suggest to brush your teeth as soon as you wake up, before breakfast. Its of no use if you are brushing your teeth after you finish your breakfast. Your saliva production is the least when you sleep, and thats when the bacterial colonies start forming. During the day time, your mouth is usually active and a rinse after breakfast is enough, as saliva too is produced for care of the teeth. If you don’t brush your teeth just after waking up, and have your breakfast, the bacteria present on the teeth gets more carbohydrates to breakdown, and causes more attack on the oral tissues instead. Acidic foods and drinks, such as oranges, grapefruit and fruit juices that are often eaten at breakfast time, soften the enamel on your teeth. Brushing immediately afterward wears the enamel away, and can cause dental erosion, which may lead to pain and extreme sensitivity in the teeth, and also lead to cosmetic problems. It still depends on how you look on it, and how you try to maintain good oral hygiene. Some people suggest and practice brushing before and after the breakfast which again isn’t always beneficial. Its good when you have a mild non-acidic food. Read on when to change your toothbrush! And tips on how to keep your teeth healthy. I totally agree with you, you to get rid of the bacteria colonies before you go to eat. 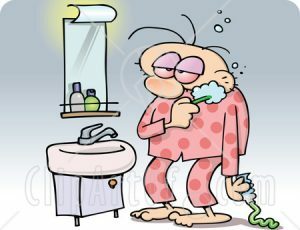 “So people Brush as soon as you get up and try avoiding Bed coffee, its bad for your teeth” !! !